JettyBlue Winter Sunday Sessions are back! 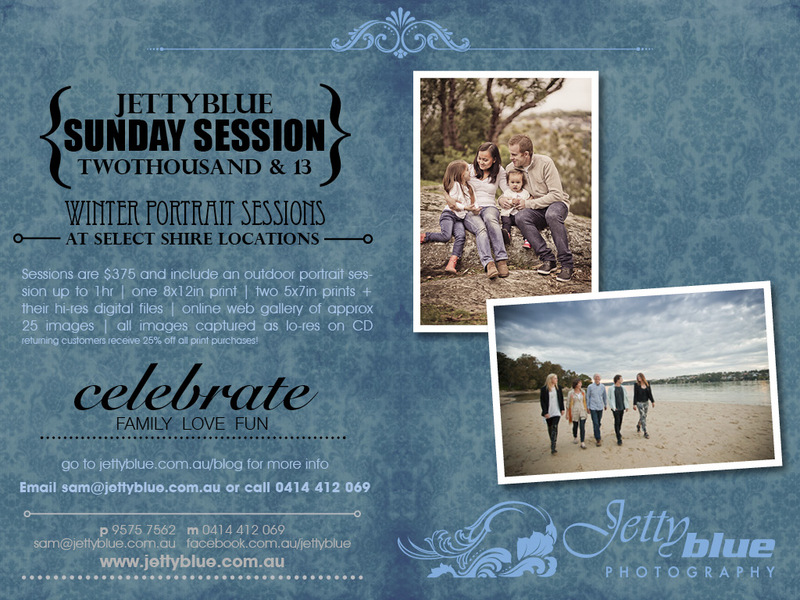 This is the 2nd year of the super popular JettyBlue Sunday Sessions and they will run throughout July and August 2013. This is the perfect time to update your family portraits now the kids aren’t at the beach all weekend and are AMAZING value for money. unlimited number of family members and wardrobe changes – its your hour, so make the most of it! all images captured as lo-res on CD, ready for facebook! Full payment is required upon booking to secure your portrait session date. 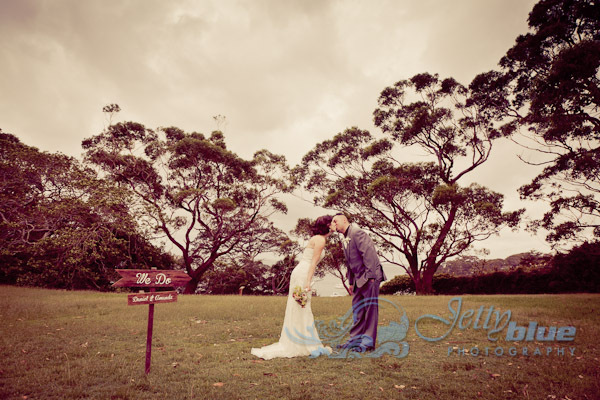 You can transfer your session to another date due to weather or sickness only. 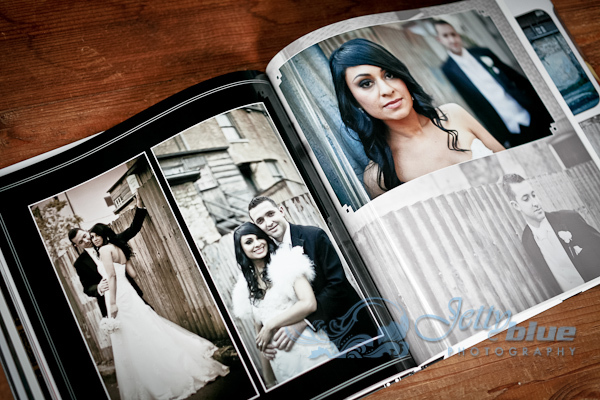 Your included prints and purchased prints all come with their matching high resolution digital files. I have a few fave Shire locations to shoot at and you can choose the most suitable one when you book. I’m also open to suggestions! 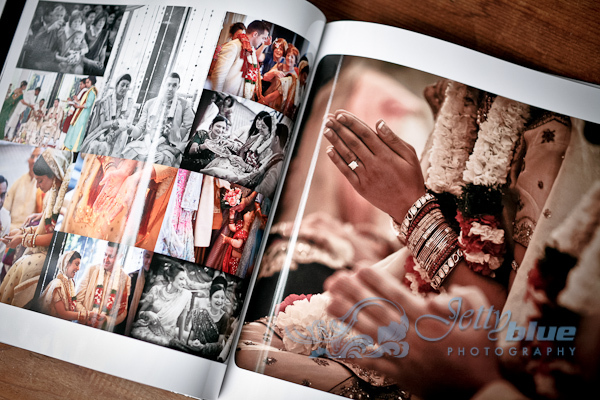 *Existing clients receive a further 25% discount on all extra print purchases so please let me know when you book. Be sure to book lickety split as all spots booked out last year! Expert Vendor for July – Personal Blooms! Running down to the end of 2013, I’m continuing to showcase a fave expert vendor of mine each month. Telling their stories and explaining what they do, why they do it and how much their customers love what they do. I have personally worked with each of these businesses and these are the businesses that I hand-pick to recommend to my brides and clients when they come and see me. Some of these vendors have been around for ages, some not so much. But every one of them has a service that is unique, is of the very best quality and is run by a person who has tonnes of passion and shares my mantra in business – “The only place Success comes before Work is in the dictionary”. 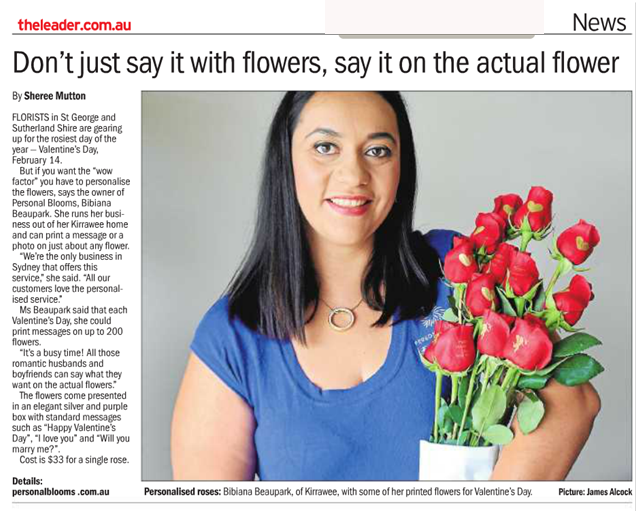 So without further adieu, July’s member of Club JettyBlue (and fellow Say I do Weddings Member) is…Bibi from Personal Blooms! If you’re looking for something unique or different to make your big day memorable, Personal Blooms have something for you! 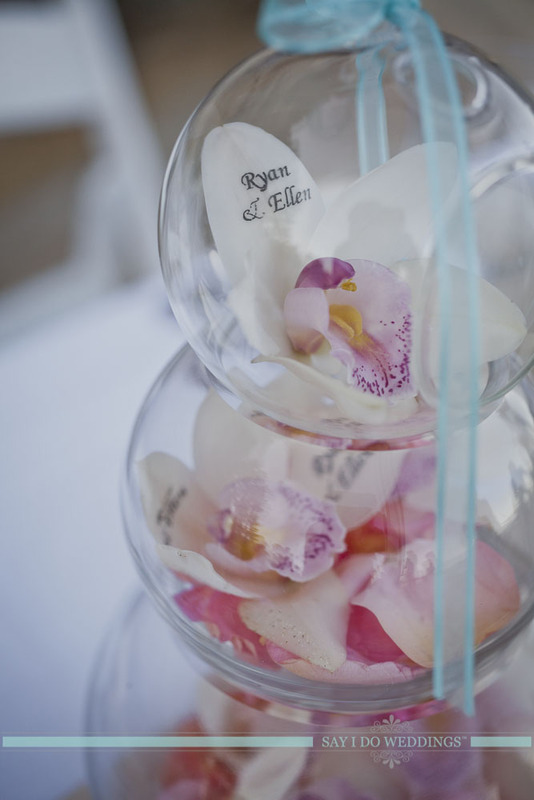 They specialise in personalised rose petals which make a beautiful addition to wedding table centrepieces or bouquets. 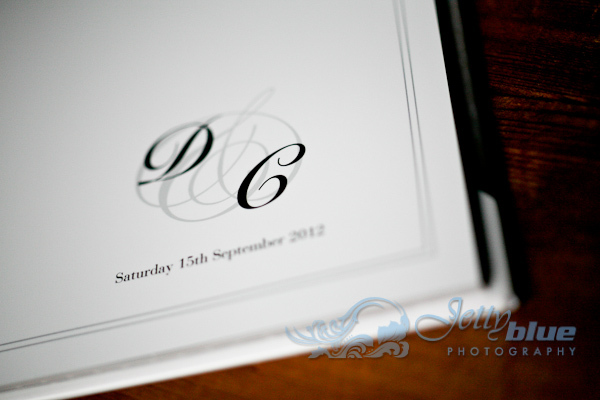 You can have the petals printed with your names or special messages for your guests to show your appreciation. Personal Blooms is a one-of-a-kind retailer of live roses and flowers that feature printed messages or images on the petals. We sell single roses, dozens of roses or complete 24 rose bouquets to make that special moment even more memorable. Personal Blooms specialises in supplying these unique roses for occasions such as weddings, valentines day, mothers day, funerals and even corporate events. Feel free to browse our online store, visit our Facebook page or contact us to get started in designing and sharing your unique creations with the ones you love. Personal Blooms is a one-of-a-kind retailer of live roses and flowers that feature printed messages or images on the petals. We sell single roses, dozens of roses or complete 24 rose bouquets to make that special moment even more memorable. The next nicest thing about roses for sale after, of course, the beauty and scent of the rose, is a rose’s ability to be fit for any occasion. Think about the variety in the roses for sale you’ve seen recently. The differing colours, smells, sizes, how tightly or how loosely the flower bud holds together, whether the rose is variegated, or one pure colour. Roses for sale could be big bunches, small miniature-rose bunches, long stemmed, large… ranging in colour quite dramatically given the continual breeding and creation of the hybrid roses. Roses for sale make a statement every day in large and small ways – roses in the hands of a bride or a partner, against a dark jacket as a button hole, in a vase in your home, hospital room across from a newborn baby, a touch of morning dew clinging to the petals. A place with roses for sale is a perfect place to start looking for a gift to express love, friendship, passion, condolences, congratulations, thinking of you or just because. Roses for sale are a hot item around Valentine’s day, but feature strongly as a favourite flower throughout the year in many parts of the world. Roses for sale can be coupled with other flowers to create a delicious bouquet, a classic tried and tested (and passed with flying colours!) roses for sale option is a dozen long stemmed roses for that most special someone, baby roses with baby’s breath is an elegant gift for that new arrival, or if you’re a person who prefers the quiet gestures over the more ostentatious ones a single rose could be the most classy gift of all. Who are you buying them for? What sort of person are they, and what colours do they surround themselves with? Are the roses for sale ready to bloom, already blooming or a mix of both? Do the roses for sale look fresh and healthy? Are the leaves in good condition? Are the roses for a child and if so, are there roses for sale without thorns? Will the roses for sale come with a way to keep them fresh if they are not being given, or taken to their final destination, straight away? Do you want to add another kind of flower to the rose if you have the opportunity to piece together a selection yourself? Which other flowers might best complements your chosen rose? Try not to be daunted by roses for sale as it is difficult to go wrong with a classic no matter the age or situation of the person you’re buying for. At the end of the day roses of any kind are a thing of beauty. You can get roses for sale in a variety of packaging options and delivery methods. And, don’t forget, when considering roses for sale, they don’t have to mean a gift for another person: they can be a gift for you, from you. Which rose do you like best? 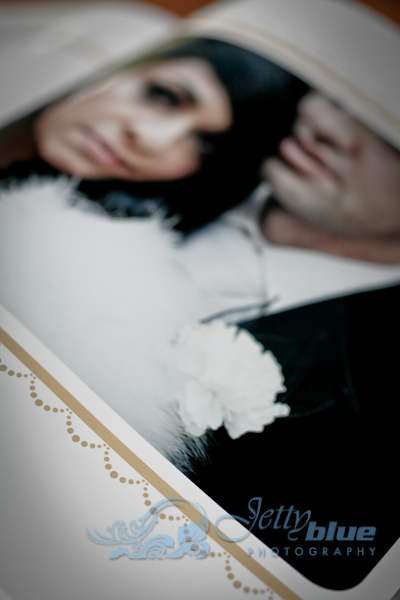 What is a “Professional” Wedding Photographer? Picture this…You’re sitting together on your 40th wedding anniversary and you want to remenisce about your wedding day so you open your wedding album. Why the album? Long after the cake is eaten, your chief bridesmaid has dissapeared to a tropical island and the agonising decision of which entree is long forgotten, the only lasting momento from your wedding day is your wedding album. Thats why. Entrusting someone inexperienced to capture your wedding day memories for all time is an enormous risk. (1) The Friend: Who has a good camera and took some nice photos while being a guest at a friends wedding. (2) The Desperately Stylish Newbie: Who has just finished a course, shot one friends backyard wedding and now fancies themselves as a pro. 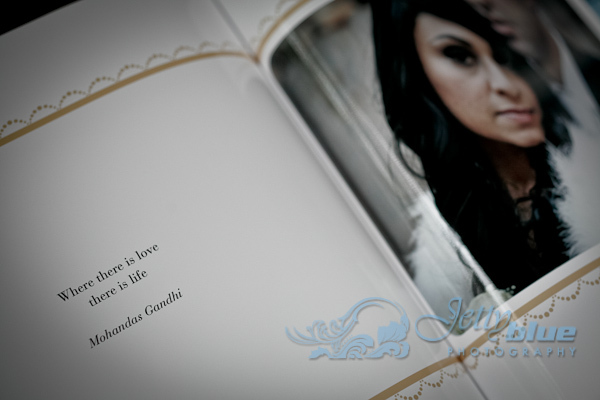 (3) And the Professional Wedding Photographer. One would say that they all take pictures. Yes, that’s right. Anyone can afford a good camera and learn the technical side, but if your expectations are high and you want something original, you need to choose very carefully.The professional wedding photographer has made his/her life’s dedication to photography. They LIVE it, it’s how they pay their mortgage. It didn’t start as a hobby and “kinda grew from there”, it started as a career commitment that includes a tertiary qualification just as a Builder, Doctor or a Specialist would commit. A professional is an artist. Not a camera operator. 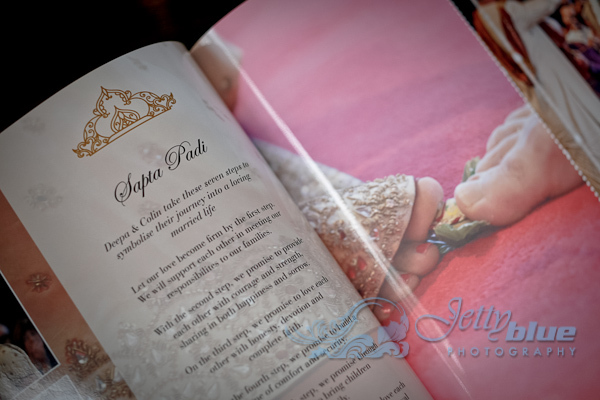 That’s the difference – the professional’s real signature is how they see your wedding day then how they translate that into beautiful images. 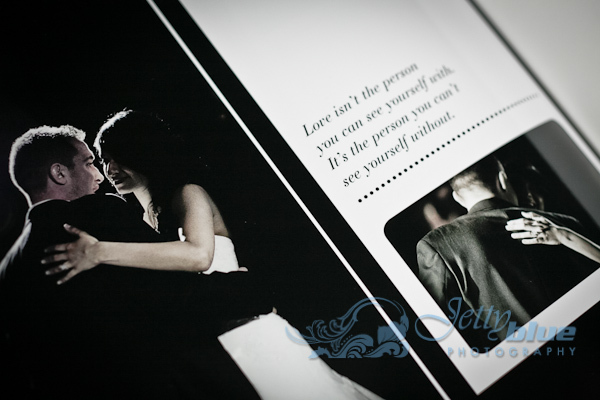 Thus, professional wedding photographers’ works are stamped with their own style, so chose the photographer and style that best suits you. 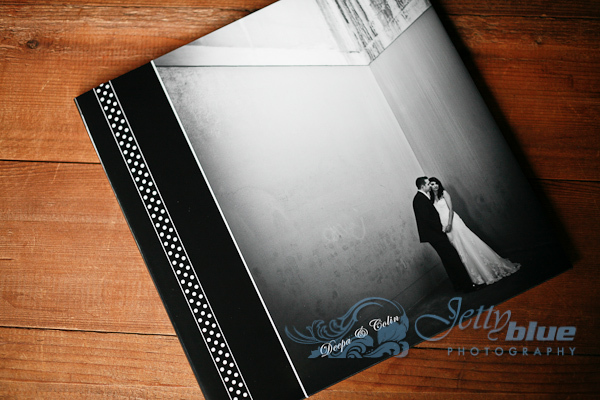 The most important point to remember is that Wedding photography is an artform in itself. It takes not only professional equipment, it takes technical mastery, knowledge of shooting in natural light, speed, stealth (especially important during the ceremony), familiarity with the area you want photos taken, creativity and most importantly – a “people” personality! There is a lot to be said for an EXPERIENCED wedding photographer, and by that I mean 10 years or more shooting weddings regularly. 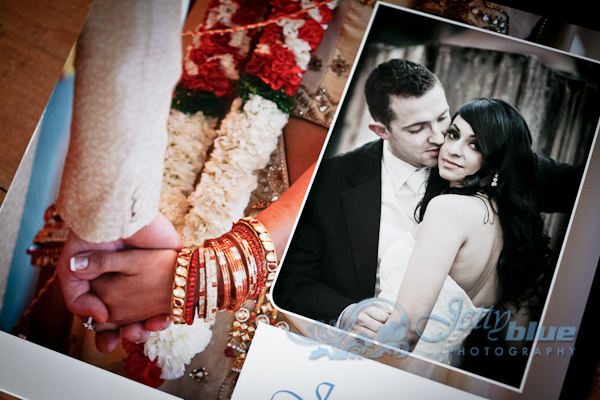 Not all people can be photographers and not all professional photographers can shoot weddings. 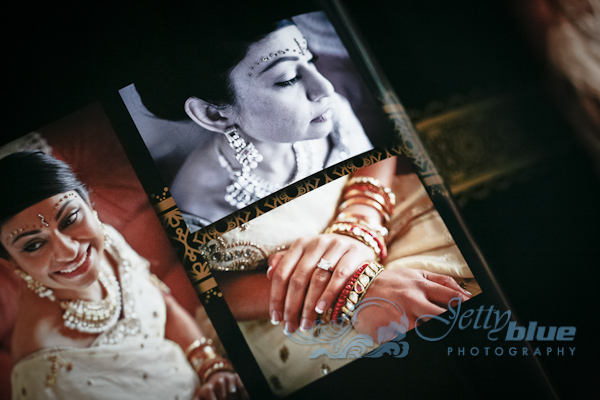 What makes a good professional wedding photographer great??? Personality! It is the one thing that can make or break a wedding day. He/she needs to fit seamlessly into a Bride’s plans, yet steer the ship away from any icebergs. He/She’ll need to keep their cool while wrangling excited family and guests, making sure the Bride is relaxed and beautiful, dealing (politely) with “Uncle Nev” who fancies himself as a hot shot photo pro, winning the heart of the Bride’s Mum by remembering not only her name but the whole family and the dog’s name too, working in with the hire-car driver who’s panicking about finishing on time so he can get to his next gig, all the while your photographer is making the whole experience nothing but fun for the bridal party without breaking a sweat and the smile never fades from their face. A professional photographer will have multiple camera bodies, use different types of lenses, will have backups and are prepared for contingencies and will photograph with no flash for 70% of the time. Digital photography technology has come a long way, so a professional photographer will be competant not just in shooting, but will be an expert in processing, retouching and archiving your digital files. They will have invested in industry standard computer hardware (not a fancy laptop), software such as Adobe CS and be proficient in how to use it. They will be committed to advancing their knowledge and keep up to date with the latest techniques by engaging with industry associations such as the AIPP who’s CDP program is designed to do just this. They’ll also be acvitely involved in their local wedding industry by participating in groups such as their local BEC or “Say I do Weddings”. If your photographer is not up to speed with the latest digital post-production techniques and processes, then check to see if they have someone on their staff that is. Great photos on the day are just the start. You want your images to look amazing, not overdone. 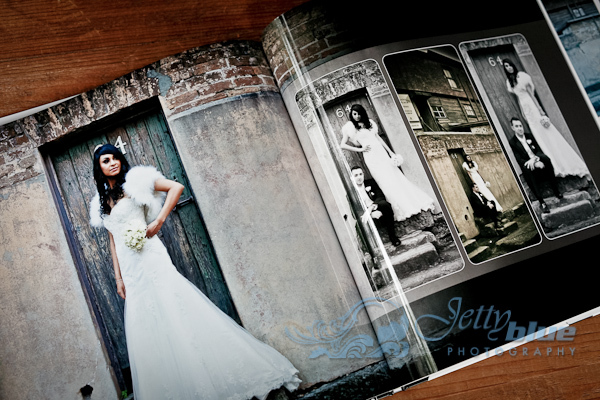 I often hear from prospective brides “but that other photographer will GIVE me the hi-res files”. There are many Newbie photographers offering a shoot-and-burn style package at what seems to be a very reasonable price. 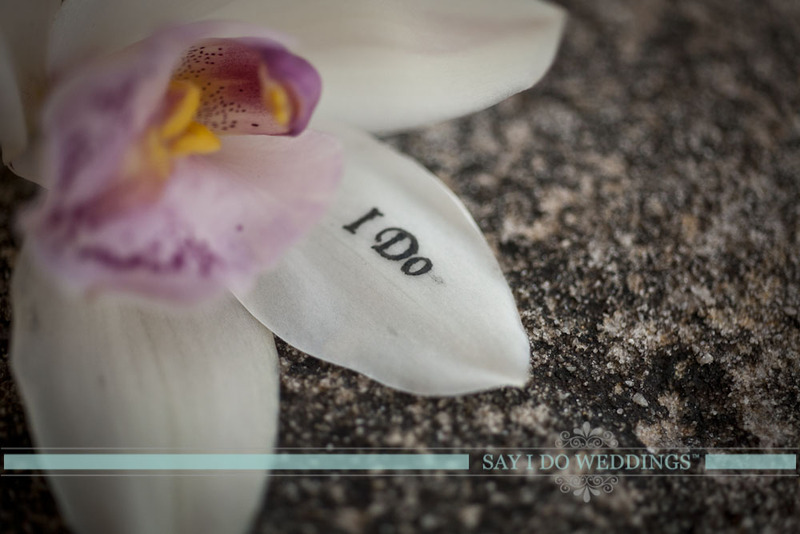 But I don’t get it – your wedding day is over and all you have is a bunch of 0’s and 1’s on a flash drive? What are you going to do, plop Nanna infront of the computer to show her your wedding photos? What if you want any prints made? Albums created? Does the Newbie have access to professional quality post-production services? I doubt it. What happens if you’re not happy with the photos or the quality of the imaging? Your Newbie isn’t going to care – he’s handed over your hi-res files as agreed and banked your money long ago and you have absolutely no recourse whatsoever. None. 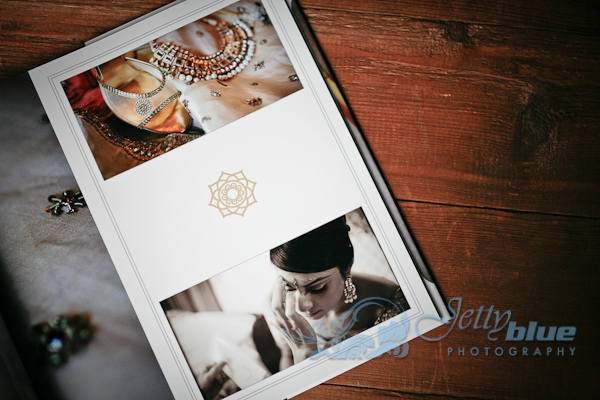 If your photographer is prepared to GIVE you their hard earned hi-res files for free, how invested in you, your wedding and their own business do you think he/she really is? Not really a bargain anymore now is it? 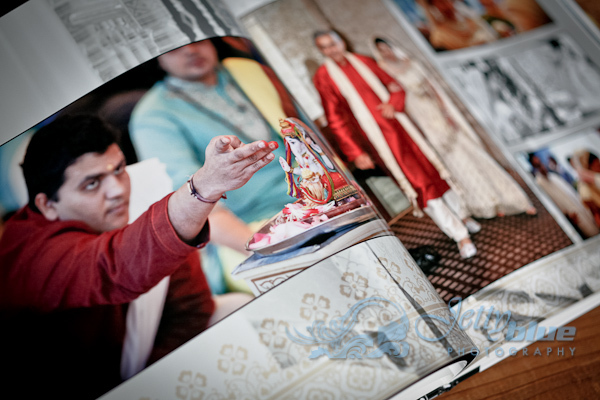 So on your 40th wedding anniversary while thumbing through your beautiful album, do you think you’ll be discussing how much your professional wedding photographer cost? 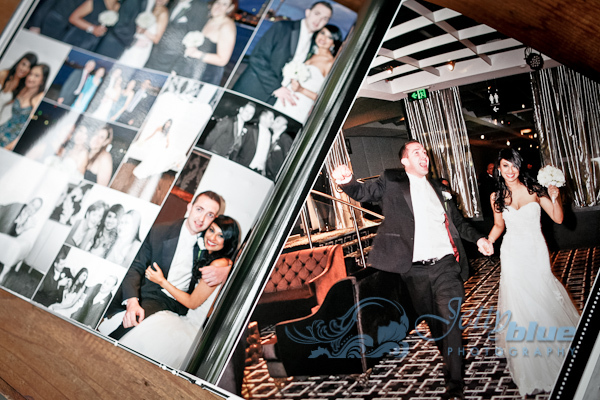 I would hope you’re too busy wiping away tears of joy at reliving all those precious moments your professional photographer captured forever more, just for you. Want to be a photographer??? I love this infogram from fotoseeds.com. It really tells it how it is for those of us who LIVE photography, not just as a side-gig on weekends, in-between full time work or just as a glorified hobby because someone told us once that we took a good pic of their dog.